The more nutrients you can stuff into one recipe, the better, right? My friend Emily tried this idea of adding shredded carrots into zucchini bread, then let me know that I should try it. Great idea. Mmmmm, so good! In a large mixing bowl combine flour, cinnamon, baking soda, sea salt, nutmeg and baking powder. Stir in honey, zucchini, carrots, eggs, and melted butter. Mix ingredients until dry ingredients are moistened. Pour into two well buttered loaf pans. Bake at 350° for 45-60 minutes or until a toothpick inserted in the middle comes out clean. 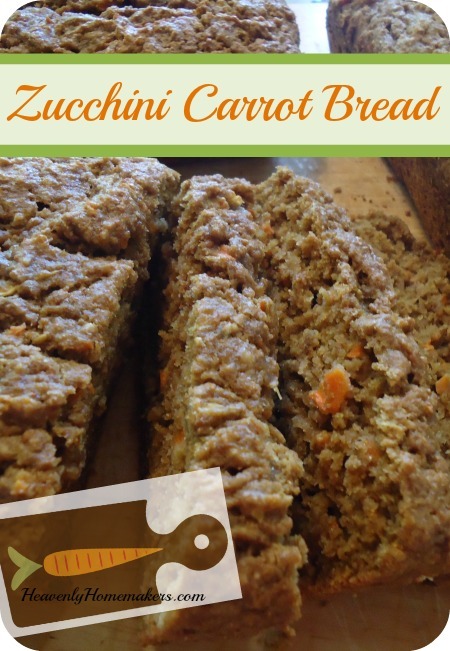 Slices of this Zucchini Carrot Bread would be perfect in your Make-Ahead Lunch Box! Simply allow the bread to cool, slice, wrap individually, then freeze. Pull a wrapped slice of bread out of the freezer, then toss it into your lunch box for a dessert or snack! What other veggie combinations have you thrown together in quick breads? Can AP flour be used in place of the whole wheat flour? If so, the same quantity? Blueberries and Beets. They were some of the best and most moist muffins that I’ve ever had. Sounds crazy but you didn’t taste the beets at all and it helped me use up the surplus of garden beets. try adding raisins to the bread, yum!